HUMMUS GUIDE:: Is Hummus mentioned in the bible? It quotes a famous Israeli author, Meir Shalev's conclusion that Hummus was mentioned in the bible. 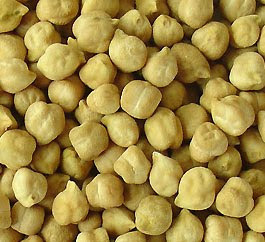 "The first documented use of chick-peas to make humus in the middle-east, is from the age of the crusaders. What few people know is that humus was also mentioned in the old testament. On the first time Ruth and Boaz had met in Bethlehem, he offered her some humus: “And at meal-time Boaz said unto her, Come hither, and eat of the bread, and dip thy morsel in the vinegar” (Ruth 2-14). This is a mistranslation of course. The original word in ancient Hebrew, is “Hometz”. Which not only sounds a bit like “Humus”, but also resembles the word “Himtza”. The Hebrew name of chick-pees. True, “Hometz” in modern Hebrew is vinegar. But you don’t really think Boaz was so rude as to offer Ruth to dip her bread in vinegar, do you?" Well, Hummus Guide's meticulous blogger did some checking of his own and based on various English translation of the bible it seems that indeed some translations don't refer to the Hebrew word of HOMETZ, as vinegar but translate it as Roasted grains, meaning that Boaz gave Ruth Roasted grains to dip her bread into - i.e. a roasted grain dish - which is very likely Humus. So it is possible that Hummus is biblical. Thanks to Hummus101 and thanks to Meir Shalev the famous and great Israeli writer for noticing this. Came upon this word as I was doing my studies today...I like digging deep to the root of things...Words. Truly, hidden treasures of great understanding are found in the roots. I am interested in finding others who are as fascinated as myself; with words and their multiple meanings and translations.